In the Supreme Court w/c 16th January 2012. Starting on Tuesday 17 January 2012 in the Supreme Court is the three day hearing of the linked appeals of Homer v Chief Constable of West Yorkshire Police and Seldon v Clarkson Wright and Jakes (A Partnership). In Homer the appellant employee of the Police National Legal Database cannot be eligible for the highest salary tier following restructuring of pay grades as they now require the employee to hold a law degree. 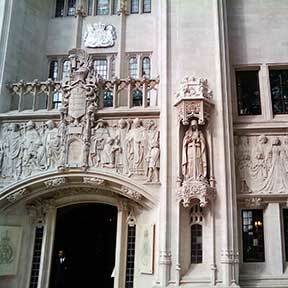 The Supreme Court is to determine the correct interpretation of “particular disadvantage” in regards to Regulation 3(1)(b)(i) of the Employment Equality (Age) Regulations 2006 in light of the respective difficulty the appellant would have obtaining a law degree at 61 compared with younger colleagues. In Seldon the issue is to define the correct approach to justification of prima facie direct age discrimination contrary to Regulation 3, where the appellant partner of the respondent solicitors firm was compulsorily retired following his 65th birthday in accordance with the terms of the partnership deed. These appeals from the Court of Appeal (Civ) will be heard by Lady Hale and Lords Hope, Brown, Mance and Kerr. In the Privy Council on Tuesday 17 January 2012 is the appeal from the Court of Appeal of St Christopher and Nevis of E Anthony Ross v Bank of Commerce Trust and Savings Association Ltd. A bench of Lords Phillips, Walker, Clarke, Dyson and Wilson is to determine whether the appellant’s certificates of deposit are recoverable from the respondent bank, which is in liquidation. Case details are not available. Leave a reply on "In the Supreme Court w/c 16th January 2012."